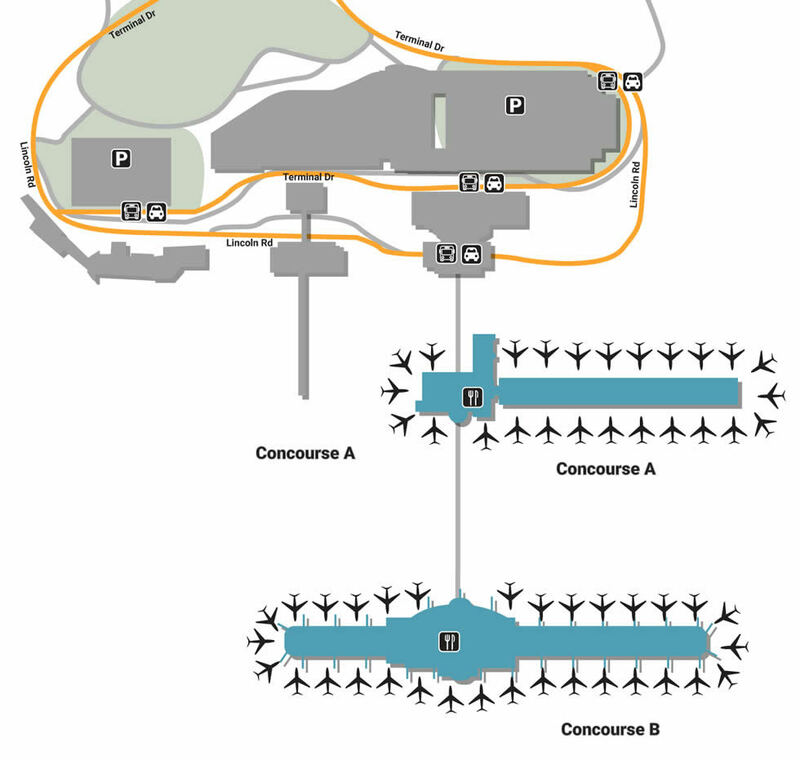 Travelers can move around the airport with our maps of Cincinnati-Northern Kentucky International Airport from Terminal Drive to the Concourse you need. Located along the junction of Indiana, Ohio, and Kentucky, the Cincinnati-Northern Kentucky International Airport offers the best of three worlds. With a window into the midwest as well as a beautiful view of the Ohio River, the facility is home to amenities that make you not only feel welcome, but right at home. Nothing prepares guests for a vacation more than getting the boring stuff out of the way. Deal with parking quickly by heading to the Terminal Garage. Go the fast & simple route by dropping your vehicle off at Curbside Valet, located near baggage claim. For premium parking that allows reserved spots, utilize Premium Parking, available on Level C of the Terminal Garage. The Terminal Garage is also home to a low hourly rate as well as the second-lowest daily rate. For the lowest daily rate, utilize CVG ValuPark, which offers the lowest rate as well as complimentary shuttles to the terminal. CVG Airport is filled with exemplary staff that’s eager to assist. If you feel stressed about something, simply look around to see the countless helping hands. For those in need of a currency exchange, head to Terminal B, Gate 12. The facility is one of the few that also offers a smoking lounge, which is located next-door at Gate 11. For those traveling on business, make sure you arrive to professional scenery by getting the notches out of your back at Massage Bar, located in Terminals A and B. CVG Airport is also home to two USO Lounges for arriving soldiers, one for each terminal. With a ton of shopping options that touch on the things we need and things that surprise us, CVG airport is a great place to find a balance. Head over to Spirit of the Red Horse (Terminal B, Gate 10) for a specialty retail shop that offers Native American jewelry alongside unique porcelain dolls. If you’re shopping with your family, walk next-door to pick up a magical toy from Creative Kidstuff (Gate 12). For those heading south, walk next-door and browse the quirky regional gifts of Kentucky! (Gate 10). If you find yourself beautifully trapped in Terminal A, head over to Forever Heather (Gate 12), a women’s accessory known for affordable, but luxurious looks. Get to somewhere good by eating something better, whether it’s a special vacation treat or a meal-deal that reminds you of home. Terminal B’s food court offers mostly fast-food with the exception of Graeter’s homemade ice cream and Urban Market’s gourmet sandwiches. Surrounding food includes Subway, Starbucks, Panda Express, as well as two bars, which are Local Pub (Gate 6) and Samuel Adams (Gate 14). Try some famous Cincinnati chili by heading over to Gold Star Chili dish in Terminal B. The Terminal B food court is also home to Chick-fil-A and McDonald’s.